Because of your letters, words of encouragement, love and support, I have gotten my fight back. I am looking forward to the near future when I can walk thru that door to the studio as a free person. Acting is everything to me …thank you for giving me hope. Violet Cameron is a young member of our acting community, and as our dear friend Babz Chula reminded us, sometimes we need to take care of each other. Despite having had cancer twice and having undergone months on end of brutal treatments, Violet has remained positive and grateful for every moment. Her words and attitude towards this serious illness are incredibly inspiring. All she wants to do is live and act and inspire others. But she needs our help to have a chance. 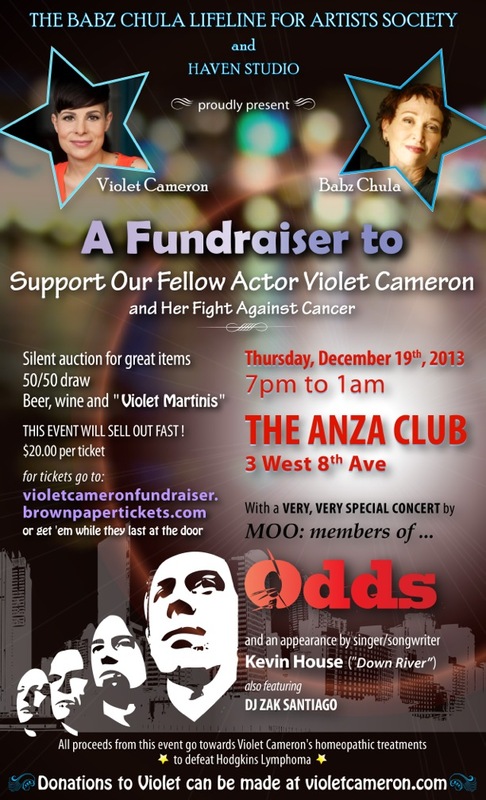 For that purpose, we are throwing Violet Cameron a fundraiser, to help out with her medical expenses. Featuring: The Odds, Kevin House, and DJ Zak Santiago, silent auction, 50/50 draw, door prizes and drink specials. Tickets: $20 each (limited number available), available at Brown Paper Tickets.